Dateline – Paris, November 30, 2015: It is the first day of Advent and the leaders of nations around the world gather to seek ways to address the dilemmas created by Climate Change. While there are some who believe that concern for the climate is antithetical to economic prosperity, there is a slow and steady awareness among business leaders that an alternative to this old either/or model can emerge. For me, the question of Climate Change is a leading edge of growing faith understanding. This issue is a way I continue to “learn to learn.” Sustainability is another way of speaking of the human responsibility to provide enduring care for God’s creation. So… Advent is a time to wait, think anew, and reconsider my beliefs in the light of new lessons from scripture and science. For years I have pondered the power and beauty of scriptures related to the the creation. The call for an integral ecology is another way of saying the deepest spiritual themes of scripture and faith are interconnected. I think of Genesis 1, where we are told that God sees everything that has been made and announces “behold it is very good.” I consider passages like the 24th Psalm (“the earth is the Lord’s and all that is within it”) or the majesty of Psalm 104 or 148 — or Isaiah 40. All of these passages are linked speaking to how we are to relate to our neighbor — especially the widow, orphan and stranger. Our Christian scriptures culminate with Revelation 21 which speaks of the fulfillment of creation as a new heaven and a new earth. Sadly, there are climate skeptics who deny both science and these compelling scriptural injunctions. Many in the U.S. Congress are voting against the plans that will be offered by the current U.S. administration this week. Sadly, these skeptics do not offer any alternative ideas. They simply deny the science — and the scriptures. Leaders in more than half of the states are suing the administration over this climate care agenda. Okay, congress and governors, disagree if you will; however, offer some alternative. Especially if you make claims about being persons of faith. At least speak to the matter of stewardship and God’s desires for the care of the earth. If one is an intelligent Christian, this season of Advent is a time to think carefully about God’s call for us to care for creation. The science regarding the dangers of climate change is compelling. Even if it were not, we persons of faith are to be good stewards of all we have been given. If you are a person of faith and cannot support the Paris proposals, then speak clearly about alternatives as to how we should live with care and respect for creation. Advent is the perfect season to think this through and then begin to offer alternatives in the new year. If, like me, you are both a person of faith and trust the science, then we may have the greater task. How can we help others understand? How will we live? What will we do to bring about change. Early reports are that several others are joining Mr. Gates in the creation of the clean energy fund; however, many donors wish to remain anonymous because there is still a considerable lobby of persons who are climate change skeptics among corporate leaders. This skepticism and resistance is changing, and apparently quickly, Steve Schein, a former CEO and now professor in the business school at Southern Oregon University has recently written “A New Psychology for Sustainability Leadership.” In it he suggests that more and more business executives are displaying an ecologically informed worldview — a worldview that for many of them has been nurtured since childhood. Several years ago a friend took me on a hike that led to a grove of trees in Indiana’s Yellowwood State Forest. It is a wonderful natural cathedral. The white pine planted in the mid-to-late 1930s are now over 100 feet tall. This grove is still a spiritual place for me. It is an Advent place — my Advent wreath — where I pray and think. It is more than a place to think and pray. You see, as lovely as these trees are they are dying too soon. Planted by the Civilian Conservation Corps, they are in an area that is often swampy and this forest lacks the necessary biodiversity of the wider forest and ground coverings all around. Still, this grove of pines is far better than the land there previously; land that was eroding and abandoned due to the Great Depression that so scoured the region in the 1930s. Something had to be done then… and it was. These trees, now one of my favorite cathedrals, were planted over 80 years ago. This was a temporary fix, perhaps only lasting 100 or 150 years. It does, however, give space for further ways the natural world might, groaning as in childbirth, bring yet another season of beauty and hope. Even if it is only a temporary fix, success at the Paris summit needs to be a part of our Advent prayers in 2015. How will church nativity pageants be different in 2015? Should we check the visas of Mary, Joseph and the baby Jesus before they process down the church aisle? Or, should they be detained before they sit beside the manger scene in the chancel? After all, these three family members were “outsiders” threatened by terror. They were vetted by the authorities and found to be dangerous. As a result, they became refugees. You remember this part of the story, don’t you? As a nation we in the United States seem to forget or perhaps simply say, “Well, that was then and this is now.” Right? Well, no, not really. The fears generated by tragic events in Paris this past week have resulted in U.S. political leaders loosing their ability to think clearly. To call the response “knee-jerk” is disrespectful to knees everywhere! The ignorance and intolerance displayed by folks like Donald Trump are not worthy of a great nation like ours. Suddenly, our greatest fear is the 10,000 Syrian refugees who are being forced by terror to seek new homes? While Jordan, Lebanon and Turkey are accepting millions of displaced refugees, we proud Americans, who are an ocean away, can’t welcome 10,000 who have been screened for nearly two years — and these are persons who are going to be placed with resettlement organizations most of which are religious groups with long histories of working with such refugees. However, rather than writing a screed on the small mindedness behind the statements and legislation that has been proposed, I choose to believe that these events just might be an early Christmas present, waiting to be unwrapped. An early Christmas gift to be shared at our Thanksgiving dinner tables. There is the opportunity here for imagination, for those who will be guided by thought, prayer, a clear-eyed view of our history to offer another version — not of who the Syrian refugees are, but who we are, especially if we are persons of faith. I think of heroes like Colorado Governor Ralph Carr, who was faced with the demands of the Roosevelt administration to set up detention camps for Japanese Americans in his state. Carr, a conservative Republican was shaped more by his Christian faith than political expediency. He said, “No, not here, not on my watch” and he paid the price of losing an upcoming election to the U.S. Senate. Today if you visit Denver you will see that the state judicial building is named for Ralph Carr in recognition an ethical clarity, drawn from his faith, that allowed him to stand for justice against the popularity of bigotry on the march. If you watch the news carefully, you will see politicians already coming to terms with their reactive bigotry. News speak is that they are “walking back statements made about Syrian refugees.” The mayor of Roanoke, Virginia is an example of one who had to change his suggestion that we go back to camps like those used to detain Japanese Americans during WW II. Presidential candidate Ben Carson now says he regrets speaking of the refugees with a rabid dog analogy. Fear is a powerful emotion mixed with self-interest in which human beings sometimes get lost in the worst of our impulses. These events, put together, provide the occasion to think more holistically and imaginatively about how to proceed. Should we accept Syrian refugees that are carefully screened. Absolutely, YES… and I think we should welcome even more. HOWEVER, this is only a start — there are dozens of other things that might be done in the United States and in other parts of the world to humanely address this crises. How do we assist those in Jordan and Lebanon and Turkey who have borne the brunt of the tragedy in Syria? How do we assist those in Europe facing these challenges? Now is not the time to play the tortoise by hiding inside our shell. The nations of the world no doubt will make increasing military responses to ISIS. There are arguments to be made as to what might be done and how. Again there will be dozens of ways to respond. As for me, there will need to be a witness against war and violence — as our continuing “go to” solution to every dangerous and hostile situation. Didn’t we get here by trusting too much in overusing the military as a solution to everything? This week, let’s join one another in unwrapping an early Christmas present at the Thanksgiving table. Make this your early gift — encourage imagination. Help others remember that our Christmas pageants are more than little parades of children in bathrobes and silly hats. Laugh, play and retell the Christmas narrative in fullness, including the parts about a refugee family driven from their home. Autumn sharpens one’s imagination. Days are filled with transition. The weather teases — do we chance leaving the tomatoes on the vine one more day? Was it frost last night, or nearly frost? When will the leaves turn? Will they be mostly golden or red or brown this year? Day to day, transition comes, sometimes slowly and sometimes in a burst. Some things end, some things anticipate a spring. This year, again, I have been planing bulbs (300 of them in the last week). Tulips, daffodils, allium. I know better, especially setting those tulips in bed for the winter, as the deer find them irresistible in the spring. I foolishly calculate that if 100 bulbs are set this fall, maybe 50 will survive, especially if I spred some deer repellent nearby next spring. Okay, so sign me up as an eternal optimist! Still, there is something compelling about autumn. A thinking person and/or a person of faith will see this as a time for hope… or, so I tell myself. I’m with Kathrine White — calmly plotting the resurrection, indeed. As I plant bulbs and trees I am aware that I may or may not be around to enjoy them 15 or 20 years hence — but my prayer is that someone will benefit and thereby be reminded of the beauty and promise found in these autumn days. This year I also planted trees — decorative plum, pear and magnolia. They stand all along the driveway. And there were three apple and two cherry trees planted last spring. I find I have to protect them all from the deer, who like to munch on the apple or cherry tree leaves or, in the case of the other trees, the bucks will come and scar the trunks during rutting season. We lost the old apple tree in the front yard this fall. A friend who knows about such things tells me the tree was approaching its 100th year… but we watched as it slowly faded in health over the past three years. Someone, a century or so ago planted this apple tree; perhaps, like me, hoping it would be appreciated by another in a distant future. This fall the time had come; we had to cut that tree down. Sad, as the old apple tree in the front of the house was one of the features we loved when we bought the place three years ago. 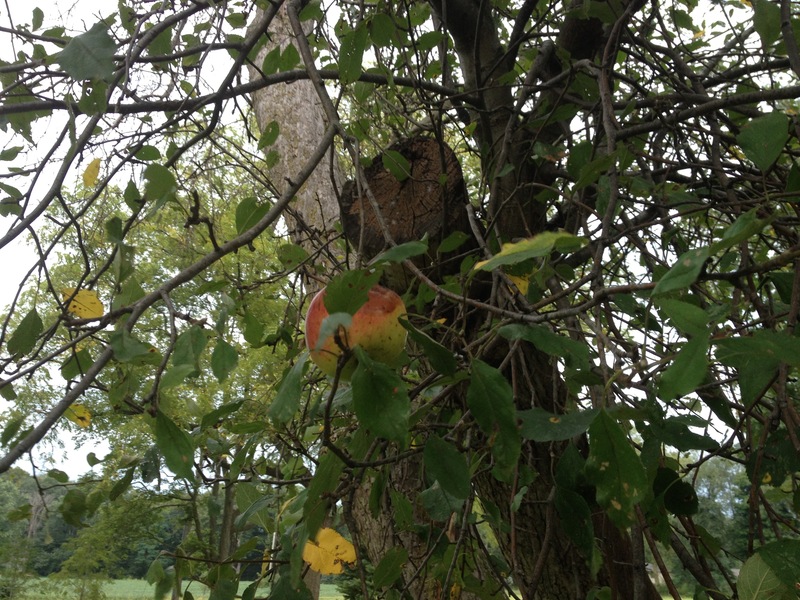 In mid-September, walking past the tree, I noticed one last apple hanging up among the few branches still clinging to life. (For those of you wondering, I took a cutting off that branch, in the hope I might plant it next spring — yes, my hope springs eternal!) The tree is now down, the wood cleared and stump ground up. That last apple — tart and memorable — has now been eaten and enjoyed. 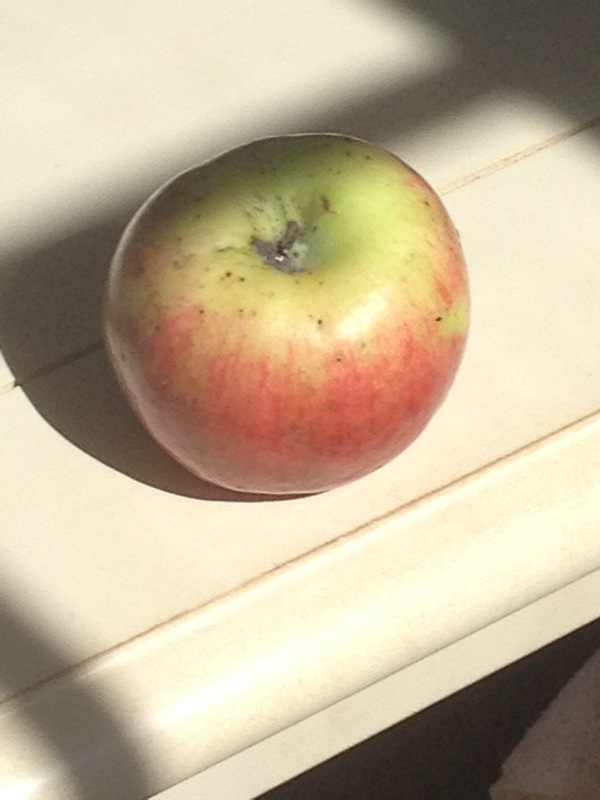 In my imagination, that last apple lingers, remaining for me as an autumn metaphor. As my seventieth birthday approaches on the cusp of a New Year, I still think of myself as young. I do this even when I am sometimes offered the “senior discount.” And this without my even asking! More and more often, when speaking of friends, I add the words “of blessed memory” upon mentioning their names. Time passes, life’s autumn season arrives. Thankfully it does not mean that imagination disappears. It is not only friends who have passed on. I find institutions and organizational cultures are often “of blessed memory.” Some gifts of courage and quality of thought I saw in the life of others seem to have evaporated in recent decades. I confess to grieving the loss of courage and imagination among many who lead my denomination, the United Methodist Church. It is strange to go to denominational gatherings and realize that there is little appetite or awareness of the need to speak prophetically on matters of justice. In this early autumn season of my life, when I look at Indiana United Methodism at least, it is easy to feel like I am one of the last apples. Today, few wise and clarion voices are speaking. The denomination is knotted up a homophobic dystrophy. There is silence. Or worse, we find a continuation of bigotry and exclusion toward gay and lesbian folks, lay and clergy. There is more — there is too often silence regarding issues of economic injustice or environmental destruction. In May 2016, the denomination will join in another General Conference — signs are not encouraging. In Indiana, I find so-called United Methodists have little in common with those who provided a place for the prophetic tradition over the past century. Maybe the old tree has been removed, chopped down, and I missed the felling of it. Maybe. There is an old saying the “the apple doesn’t fall far from the tree.” I wonder. Sometimes I look around and think the whole orchard has been moved or chopped down. What was once Methodism has become something wholly different. Perhaps this new orchard is one of persimmons or crab apples. I am surprised by the way a pathetic, poorly articulated and distorted Calvinism (dividing the world into the “saved and the fallen” with no hope for transformation or renewal) has replaced the Wesleyan vision of redemption and perfect love. Even so, I can’t stop kneeling and planting the bulbs — and trees — of the future. I will still try to take cuttings from the old tree and see if these can be brought to life — and perhaps appreciated by someone 100 years from now. Maybe I am not among the last apples after all.